Tennessee Birding Trails is a great website for locating trails for specific types of birding. Tennessee Birding Facebook group has an active community of birders who post often. Tennessee Ornithological Society (TOS) Nashville Chapter is having their Radnor Lake Wed morning bird walks September 19th and continue each Wednesday through October 10th. Please meet in the west Parking lot outside the Visitor’s Center at 7:30am. Come rain or shine. With the exception of ongoing downpours or thunderstorms. TN-BIRD email list is a free list that allows you to get updates of bird sighting from other birders in the area. to receive emails simply click on “find and join” at the top right of the tn-bird page, search for list name tn-bird, and follow the instructions on signing up your email. One of the more interesting, easy, and fun things to see in the fall is the migration of Chimney Swifts and Common Nighthawks. 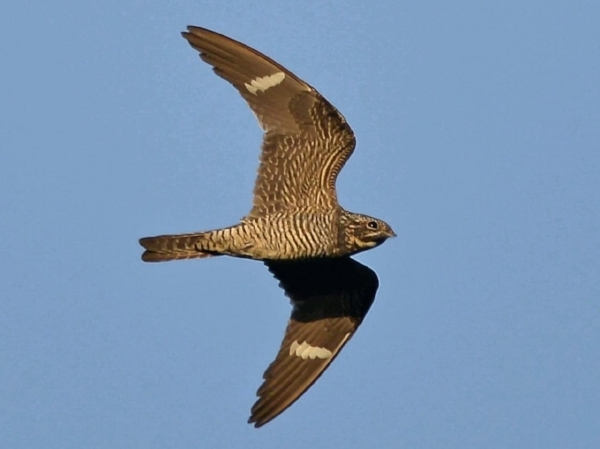 In the evenings, particularly in areas where there is outdoor lighting, like high school football games and shopping malls, Common Nighthawks gather and feed on insects. Downtown areas tend to be very productive areas to see both. The Common Nighthawk, a member of the Goatsuckers family, measures around 9 1/2 “in length. They are gray-brown with slim, long wings that have a distinctive white bar near the tips. They are most active at night but can be seen midday as well. They fly with long easy strokes but can quickly change direction and appear erratic as they catch flying insects. Male Nighthawks have a white throat and white band across a notched tail. Listen for the unusual “peent” call of the Nighthawk. The Chimney Swift is a short swallowlike bird with long, slightly curved wings. Peterson’s field guide to Eastern Birds describes it as a “cigar with wings”. Always in motion, Swifts appear to continually fly never landing to rest and constantly “twitter”. They measure about 5 ½” in length and are uniformly grayish to brown. During migration Swifts have been known to roost together by the thousands in a single chimney. On more than a few occasions I have witnessed a “funnel” of swifts descending into the chimney of a downtown building while on my way to a Predators game. It is a fascinating sight. We may see Ruby-throated hummingbirds well into October so keep your feeders out with fresh nectar as there may be several waves of hummingbirds still coming through TN on their return to Central and South America. The belief that feeders should be taken down to cause the birds to migrate is incorrect. They will leave when they are ready whether there is a feeder present or not.